This document will be updated as further floods occur or additional information becomes available. If you have any enquiries or know about other floods not listed please contact Michael Bath. For current rainfall, river height and flood warnings refer to the Bureau of Meteorology Rainfall and River Conditions. 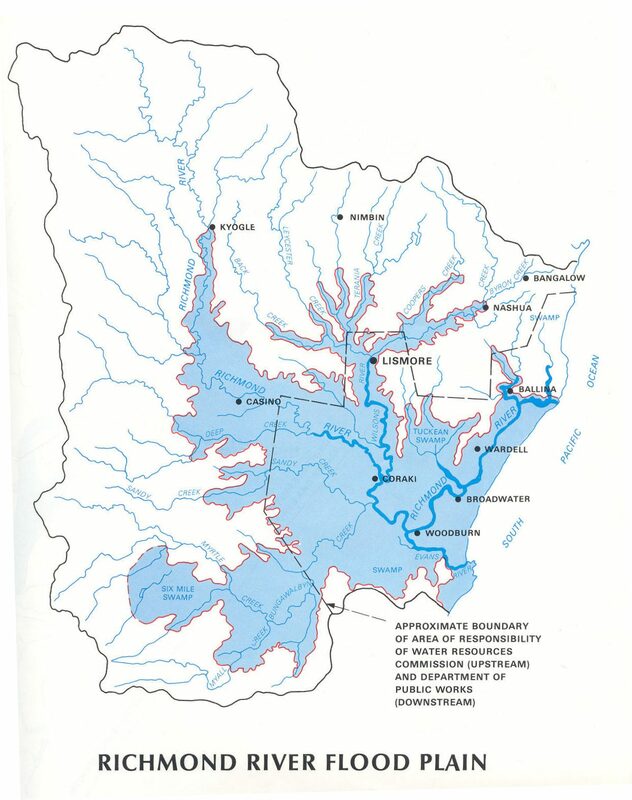 The Northern Rivers district of NSW, Australia is one of the most flood prone areas of the country outside of the tropics. With Lismore at the junction of two major streams - Leycester Creek and Wilsons River - it is often subject to significant flooding. Lismore aerial photo and location map from Google Maps. Click for larger view. The Wilsons River, Leycester Creek and tributaries upstream from Lismore represent only about one-quarter of the Richmond River catchment, however the majority of flooding occurs in this area and through to Coraki. The Nightcap Range to the north of Lismore, and hills extending through Bangalow to near Alstonville often receive much higher rainfall than the rest of the region due to orographic effects and because it is closer to the coast and the source of rain-bearing clouds. The floodplain is also narrower due to hilly terrain. South and west of Lismore the terrain is quite flat and the floodplain very wide in comparison. Major flooding of the Richmond River upstream from Coraki requires heavy rainfall west of the Nightcap and Border Ranges and into the eastern parts of the Richmond Range. This occurs far less frequently than Lismore flooding, with February 1954 and January 2008 the stand-out events for Casino, Kyogle and Wiangaree. Heavy rainfall occurring over the generally flat country and eastern parts of the Richmond Range in the southwest of the catchment contributes to flooding at Coraki, Woodburn and downstream. Heavy rainfall on the southern side of the Alstonville Plateau also affects the Lower Richmond River. 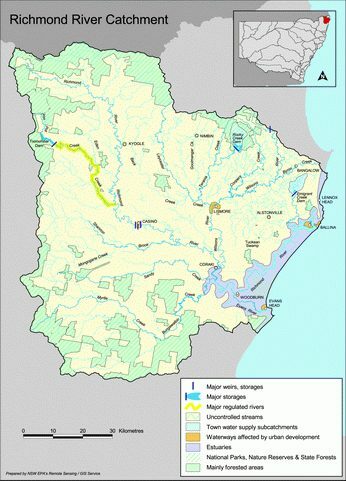 Another part of the catchment is the Teven Valley and North Creek northwest and north of Ballina. Flooding can occur in this area during very heavy rainfall although those waters quickly enter the Richmond River. The Lismore flood gauge is on the rowing club building at the western end of Magellan Street (red dot on the Lismore Map) and became operational in 1917. River heights since the November 1917 flood are all taken from that point. Prior to 1917 the flood gauge was on Fawcetts Bridge, where Woodlark Street crosses the Wilsons River. Flood heights prior to 1917 cannot be relied on for the purposes of present-day comparisons. Australian Height Datum (AHD) was introduced in the late 1990s. AHD flood height measurements are 0.78 metres lower than the old gauge readings that many readers may recall. Flood heights in other parts of Lismore vary depending on a number of factors including the volume and speed of water coming down the Wilsons River and Leycester Creeks, the amount of local flooding due to heavy rain in Lismore, whether the Browns Creek pump is operational and whether levees have or are being overtopped. The Lismore central business district used to begin flooding when the Wilsons River reached 9.42m AHD. Water would flow into the streets near the old Post Office at the corner of Molesworth and Magellan streets. Major flows into the city would occur by 9.72m AHD with most of the CBD inundated when the river level reached 10.22m AHD. A concrete wall flood levee was constructed over a couple of years and finished in March 2005. It protects the CBD from floods up to about 10.65m AHD. Flood waters during major events will still top the levee but will start to enter streets at the Browns Creek spillway on Molesworth Street between Woodlark and Zadoc streets. A long established earthen levee protects South Lismore from all but major floods exceeding 10.95m AHD. North Lismore has no flood protection and is the first area to be cut off. The highest recorded Lismore flood levels were on 21st February 1954 and 11th March 1974. Signs such as this one are displayed on power poles throughout the city to mark the highest level floodwaters reached. Daily rainfall data from all sites in the Northern Rivers and eastern parts of the Northern Tablelands are included for each flood event. Tropical cyclone tracking map links are listed where it is known they directly or indirectly contributed to a flood event. Infrared satellite picture loops are available for flood events since 1983. This table includes all known floods that reached at least the minor flood classication level at the official Lismore gauge. There have been many other significant rain and flood events in the Northern Rivers region which have not reached the minor flood level in Lismore. Flood levels listed prior to 1917 are incomplete and cannot be directly compared to heights at the Rowing Club gauge in Magellan Street. 21-22nd January 1887 Flood height was an estimate of 38 feet. 18-19th July 1889 Flood height was an estimate of 31 feet 8 inches. 8th March 1890 Flood height was an estimate of 40 feet. 2-3rd April 1892 First flood height measurement using the Fawcetts Bridge (Woodlark Street) gauge. All previous heights were estimates. 11th February 1893 February 1893 was Lismore's wettest month with 799mm on 27 raindays for well over a century, only exceeded during March 2017 with 806.8mm. Flood peaks were likely 11-12 Feb and also 16-18 Feb. Some publications have the 1893 flood occurring in March 1893 but the rainfall figures show it was February 1893. 31st March 1904 Rainfall data shows a significant flood occurred 31st March - 1st April though no height is available. 8-10th November 1917 First flood height using the Rowing Club gauge at the end of Magellan Street. All flood heights from this date forward can be compared. 15-17th May 1921 Rainfall data suggests the May 1921 flood may have peaked higher than this. 5-18th March 1925 Prolonged flooding with possible multiple peaks in the moderate range. 24-28th January 1927 Possible minor flood on the 11th with moderate flooding from the 24th. 9th May 1934 This event is not listed in the archives. Rainfall figures suggest a moderate flood was likely. 8-17th March 1937 Probably two peaks: 10th and 17th. 31st December 1943 Flood peak may have been 1st January 1944. 11th June 1945 Mostly likely an East Coast Low. Rain stopped 6pm Monday. Worst in history. Browns Ck raging torrent over Spinks Bridge. River peak may be higher than this. 15-18th June 1948 Peak most likely evening of 16th. 28th February 1950 Prolonged period of wet weather which eventually led to a minor flood peak. 21st February 1953 Creeping flood from a prolonged period of very wet weather. 5-6th April 1955 Low presure system that caused the previous flood a week ago returned. 11pm 18th February 1956 Rain event earlier in the month then a tropical low moving S-SW. Robert White bridge collapsed. Sudden stop to rain Saturday afternoon. Sensational rise in creek levels at Nimbin. 19-20th June 1958 Rainfall data suggests flooding around the 11th as well - perhaps two peaks occurred. 21-24th January 1959 Caused by Tropical Cyclone Beatrice. 6-8th January 1962 Rainfall data indicates another minor flood peak was likely on the 15th. 11am 11th July 1962 Cyclonic depression off Gold Coast. Highest ever peak Repentance Ck, The Channon, Bentley. Flood firsts - NRTV, Northern Star uninterrupted production. 7pm 8th May 1963 Trough in central western districts. Upper low then surface low off Cape Byron Tuesday night. All North Coast flooded. Equal highest peak Bentley. This flood followed a minor flood just 10 days earlier. 26-27th March 1964 Some heavy rainfalls also occurred between the 8th and 10th March. 1am 21st July 1965 Very cold southerly then rain depression moving south. Possibly similar to September 1988. Only 6 raindays in whole month. Worst drought in years. Deepfreeze over state. Snow in Sydney. 1st flood for the Tuckombil Flood Canal. Waterspout off Cape Byron. 11am 19th March 1967 Tropical Cyclone Elaine and another tropical low operationally classified tropical cyclone "Dulcie" combined. Record floods in north Queensland. 3am 13th June 1967 1st peak. 4pm 14th June 1967 Lows off SE Queensland coast. 1030hp high. Worst flooding on the Gold Coast in 25yrs. Grafton badly hit. 2nd peak in Lismore. 11am 23rd June 1967 Another low off the coast moving quickly south. 2am 28th June 1967 Complex trough and depression off coast near Cape Byron. 1030hp high. Seas batter coast. 4th June flood peak. 6pm 13th February 1972 Tropical Cyclone Daisy and Tropical Cyclone Wendy. 1036hp high. Severe beach erosion. 1st test for Browns Creek Pump which cut the flood peak by feet. 3-4th April 1972 Tropical Cyclone Emily. 6am 29th October 1972 Upper disturbance then a low in north of state. 1030hp high. First October flood. Browns Ck Pump kept water 1m lower in basin. Record rainfalls for year and month. 6pm 27th January 1974 Tropical Cyclone Wanda and intense rain depression moving SE from NW Queensland. Australia Day Flood. Massive flooding in Brisbane - worst of the century. am 11th March 1974 Upper disturbance and very small localised low pressure. 1028hp high. South Lismore levee breached. Shock flood worst ever. Highest ever peaks Wyrallah, Tuckarimba, Coraki, Woodburn, Bungawalbyn. Brisbane 2nd Flood. am 13th March 1974 2nd peak due to Ex-Tropical Cyclone Zoe moving rapidly south. 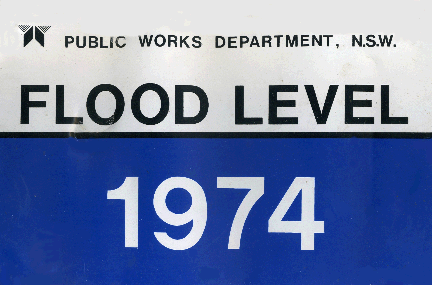 '74 Flood - second hit. 3pm 23rd April 1974 Upper disturbances in north of state. 1030hp high. 4pm 3rd June 1974 1030hp high. Small low off border. Flood peril returns. 10 years to recover. 12pm 3rd March 1975 Upper disturbance then surface low off the coast. 1030hp high. SES spot on with predictions. Waterspout or tornado Lennox Head. 6am 12th February 1976 Tropical depression moving across country. ex TC. Weak high. Tabulam devastated - worst flood ever. 9am 29th February 1976 Upper disturbances. NE winds from weak high then Tropical Cyclone Colin. Leap year flood. Wilsons river currents - 4ft/hr rise. Sirens used. Teven devastated. Highest ever peak Nashua, Eltham, Tatham. Federal recorded 290mm of rain in just 4 hours. 12pm 19th March 1978 1034hp high cradling deepening low moving SW. Mt Nardi Deluge - 660mm. 7am 10th May 1980 Strengthening high and small low moving south. Rain a boost to district - a lot more needed though. 4pm 23rd June 1983 1028hp high, upper disturbance and small low moving south. 1st satellite photos in paper. 1am 10th April 1984 Ex-Tropical Cyclone Lance and northern NSW low. 1030hp high. Gales. Major flood a close thing. House With No Steps losses great. 8am 6th March 1987 Small low off Tweed Heads which formed from Ex-Tropical Cyclone Elsie after it crossed country. 1030hp high. Lismore ready for major flood. Worst since 74. Rocky Ck dam full. Drought preceded flood - especially on Gold Coast. 8am 11th May 1987 Slow moving 1037hp high and upper air disturbance. Mothers Day Flood. 2nd major CBD inundation in 2 months - only year to have two major floods. 10am 7th April 1988 Tropical low moving across country and upper disturbances and lows off SE Queensland. Easter Flood. Floods in red centre, NSW and QLD. 5pm 12th April 1988 Small low and upper disturbance. 1038hp high. Longest flood. Woodburns worst - not highest. 2nd peak in Lismore in a week. 11pm 16th September 1988 Deepening low moving down coast. 1030hp ridging high. Rain stopped just in time. First September flood. 29th January 1989 Two weak lows moving down coast. 1020hp high. 11am 2nd April 1989 Multiple upper disturbances. Slow moving 1037hp high. April Fools Day Flood. Leycester Ck pushed back Wilsons. Incredible rise of river. South Lismore levee breached. Oil flood. Tropical Cyclone Aivu North QLD. 6am 27th April 1989 Upper low then deepening surface low moving down coast. 1034hp high weakening. 2nd flood in a month. Cyclonic wind - Easterly then calm then Westerly. pm 3rd February 1990 Tropical Cyclone Nancy with well developed upper trough extending to Victoria along the East Coast. 1026hp high over NZ and 1034hp high over Bight. Major flooding in Sydney and Hunter Valley. Eye of tropical cyclone crossed Cape Byron - winds were calm for a short time. am 7th April 1990 Upper air disturbance from ex TC Ivor, and 1036hp high centred in the Tasman Sea. Minor flooding in Lismore but moderate flooding on the Clarence River. The remains of TC Ivor as an upper low, continued for two more weeks and caused the worst flooding ever for western NSW and Qld. 2pm 13th December 1991 Slow moving front and upper air disturbance combined to form an east coast low, which then moved south. 1026hp high in the Tasman Sea. Moderate flooding in Lismore and Murwillumbah. Two deaths. Heavy rain for only 24 hours. Severe flooding at Nimbin with 300mm in one night caused some of the worst flooding ever there. 9pm 3rd May 1996 A few locations along the Border Ranges received around 1,000mm of rain in a week. 11am 7th May 1996 2nd peak at Lismore. Rainfall figures reveal another rainfall event around 17th May but it was fairly coastal in extent. 6pm 2nd February 2001 First major flood in Lismore for 12 years - this was the last straw in getting the flood levee constructed. Many locations received over 400mm of rain in 36 hours. 6pm 5th January 2008 Although the river peak in Lismore failed to reach the major level, elsewhere in the district it was the biggest flood since 1954. The entire catchment was saturated from days of rain, then further extreme rainfalls fell in the Tweed and Upper Richmond rivers during the evening of Friday 4th January. 2-3pm 22nd May 2009 This event was very well forecast by the weather models many days before it occurred. A slow moving upper low moving over western NSW and central/southern QLD, along with a blocking Southern Tasman Sea high with deep onshore flow onto the East Coast resulted in a persistent coastal trough/low setup. Several intense meso-lows formed in the trough and brought very heavy rain and destructive winds - particularly to the Northern Rivers region on Thursday 21st. Major river and flash flooding occurred between the Queensland Sunshine Coast and Port Macquarie between Wednesday 20th to Sunday 24th May. In Lismore, the new levee once again saved the main part of the central business district from inundation - but only just - another hour of heavy rainfall and it would have over-topped. Flooding was major in the Wilsons, Richmond and Clarence rivers, with the Tweed and Brunswick Valley not as badly hit. 6am 12th October 2010 Heavy falls in the eastern part of the catchment on 3rd and 4th of October were followed by a second rain event less than a week later. A strong high pressure was anchored in the Tasman Sea. A mid level trough in the southern Coral Sea tracked westward and crossed the coast during the morning of the 11th. This time the heaviest falls were in SE QLD however local rainfall was enough to push the Wilsons River in Lismore to minor flood levels. noon 28th December 2010 A prolonged period of moderate to heavy rainfalls across the region due to the influence of the monsoon trough. Many centres received 250 to 300mm between the afternoon of 24th December and the afternoon of the 27th though Boxing Day did see lighter rain until later in the day. An unusual aspect of this system was that most rainfall streamed down from the northwest from mid to upper level cloud rather than from the usual low-level onshore flow. The upper Richmond River went into major flood with parts of the Kyogle CBD inundated from late evening 27/12 with a peak of 15.94m at 4am 28/12. The Wilsons River at Lismore peaked at 4.91m at 5am 26/12 before the main peak two days later. 8.30pm 11th January 2011 Another prolonged period of moderate to heavy rainfalls across parts of the region from 5th to 11th January due to a slow moving upper low and the monsoon trough. Extreme flash flooding occured in Toowoomba and the Lockyer Valley (in SE QLD) on 10/1 with major river flooding through greater Brisbane 11-13 Jan - the worst since 1974. Most of the Northern Rivers did not receive heavy falls, only the northwest parts and adjacent Northern Tablelands - parts of which had record flooding as well. Tenterfield, the MacIntyre River Basin (Bonshaw, Ashford) and the Clarence River (Tabulam, Grafton and lower river) all had major flooding. The several days of moderate rainfalls eventually pushed the Wilsons River at Lismore to minor flood levels. 12.20pm 26th January 2012 A persistent upper level low over western NSW and southern QLD combined with a high pressure system in the Tasman sea (and a second quickly replacing it) to deliver a deep E-NE flow and resultant prolonged rain event for NE NSW and SE QLD. A number of surface troughs near and on the coast during the week contributed to some flash flooding too. The hardest hit areas were the Tweed, Bellingen and Sunshine Coast areas though flooding occurred in most regions between Taree and Noosa Heads. The heaviest rainfalls in the Wilsons River catchment occurred between midnight and 3pm 25th January. 8.40pm 29th June 2012 A fairly strong high pressure system moving across SE Australia and the South Tasman Sea directed moisture into a surface and upper trough just off the SE QLD / NE NSW coast. A low pressure system formed off the SE Queensland coast overnight 27/28th June though with the high weakening it was not enough to result in massive rainfalls. However there were extensive rainfalls in the 100mm to 150mm range across the coastal Northern Rivers district - most of which fell between late on the 27th through to early on 29th. It was the second flood in a month for the Wilsons River upsteam of Lismore though the earlier event (11-12th) failed to reach minor flood levels at the official Lismore gauge. The Eltham gauge peaked at 6.95m at 1pm on 29th June, and at 7.24m at 12.10am on 12th June. 10.30am 29th January 2013 Ex-Tropical Cyclone Oswald took an extraordinary track down the East Coast (over land) after being a category one system for a few hours in the Gulf of Carpentaria. A strong blocking high over New Zealand helped steer the tropical low and monsoon trough slowly along the entire length of QLD and into NSW over a week. Record heavy rainfalls hit many areas but one of the stand-out features was the destructive winds (of category one strength) and numerous embedded tornado reports along the coast. Lismore managed to avoid a major flood and the levee again saved parts of the CBD from inundation - thanks to lower rainfall totals in the western part of the catchment. Parts of the Tweed, Lower Richmond and Clarence endured major flooding, with Grafton recording its highest ever level of 8.09m - just centimetres below the top of the levee wall. 6.30pm 23rd February 2013 A prolonged period of wet weather occurred from the 13th as a result of an upper trough and a strong blocking high pressure system directing a deep moist layer into northern NSW and QLD. A surface trough developed off the coast on the 17th followed by a low off Central QLD late on the 18th. This low tracked SSE parallel to the coastline then did a loop in the North Tasman Sea before slamming into the Northern Rivers coastline during the 22nd Feb as the equivalent of a category one tropical cyclone with regards to wind speeds. Ballina and surrounds bore the brunt of the wind damage. Rainfall accumulations were substantial over the many days of this event but increased sufficiently 21-22 Feb to result in moderate flooding in Lismore. The Low was also responsible for major flooding in southern parts of the Northern Rivers and throughout the Mid North Coast. 7.30pm 3rd March 2013 The lower Richmond River had only just dropped below minor flood levels when an upper trough delivered further heavy falls to the Northern Rivers. This system had brought widespread rainfall across most of NSW before combining with an onshore flow and focusing on the North Coast and Southeast QLD. Rainfall accumulations were mainly less than 150mm in the Northern Rivers for the event but with a saturated catchment the Wilsons and Richmond rivers again went into flood. 11pm 2nd July 2013 An East Coast Low formed off the SE Queensland coast in response to an upper trough passing over the region, and a pre-existing coastal trough. Gale force southerly winds and widespread rain fell across the northern two-thirds of the Northern Rivers district particularly during Monday 1st July and early Tuesday. Rainfall accumulations reached 150 to 200mm over 36 hours in some locations and this was enough to push the Wilsons and Lower Richmond River into minor flood. 2pm 28th August 2014 A strong blocking high pressure system in the Tasman Sea combined with a series of upper troughs to deliver two weeks of wet weather culminating in an East Coast Low on the 27th. Significant falls fell across parts of the Northern Rivers during the 27th quickly clearing pre-dawn on 28th. Unusually the Nightcap Ranges and Tweed region missed out on the heavy rainfalls. The lack of heavy rain to the north of Lismore limited the flooding to minor. 9pm 21st February 2015 The weather patterns had the potential to produce major flooding in the Northern Rivers district with a strong high in the southern Tasman Sea, coastal trough and a tropical low moving towards the southern half of the QLD coast. However the Coral Sea low far exceeded all modelling and became category 5 Tropical Cyclone Marcia. This intensity change resulted in the trough largely remaining offshore instead of over the Northern Rivers and reduced the rainfall potential. Regardless there was still widespread falls of 150 to 300mm over 36-48 hours for the Northern Rivers and north-eastern Northern Tablelands to late evening on the 20th, with minor to moderate flooding in some streams. 7pm 2nd May 2015 A strong high pressure system crossing southern Australian into the southern Tasman Sea directed a humid easterly air mass onto the NSW and southern QLD coastline for a number of days. Combining with an unusually strong upper trough passing over NSW into SE QLD, this helped induce surface troughs inland and along the coastline by Wednesday 29 April. The resulting instability led to a number of days of patchy heavy thunderstorm/rain events culminating in the development of an East Coast Low on Friday 1st May. Widespread rain and embedded thunder occurred on this day, peaking during the afternoon and early evening, before a fairly rapid clearing as the low moved over SEQ and started to weaken, although some narrow convergence lines persisted in the region until late on the 2nd. The western half of the Wilsons catchment received less than half the falls over the east, with the highest totals in the eastern parts of the Alstonville Plateau. 5pm 5th June 2016 A well forecast event by weather modelling which was showing up nearly a week ahead. A sharp upper trough which evolved into a cut off upper low moved northeast across NSW into SE Queensland. A surface trough was present along most of the East Coast with a large blocking high over New Zealand feeding in rich Coral Sea moisture. The upper low induced a surface low drawing in the existing trough. A convergence line edged across SE QLD and Northern NSW during Saturday, peaking during the evening on the Northern Rivers. An east coast low developed early Sunday along the Coffs Coast. This was a massive system bringing flooding rains from the Sunshine Coast to Tasmania over several days. The bulk of the rainfall in the Northern Rivers occurred between 6pm Friday and the AM hours of Sunday. 11am 31st March 2017 Exceptional rainfalls fell across parts of SE Queensland and NE NSW as a result of Ex-Tropical Cyclone Debbie tracking into SE QLD after crossing the Whitsunday Coast as a category 4 system two days prior. For the Northern Rivers almost all the extreme rainfall fell in a 24 hour period from 1am Thursday 30th March until 1am 31st, ahead of the low moving off the Gold Coast and contracting the rainfall away, though still delivering a blast of damaging winds. The heaviest rainfall fell across the western two-thirds of the Wilsons River catchment with some locations receiving around 700mm in 24 hours. The eastern part of the catchment (upstream of Eltham) received a lot less, though the outcome of a massive flood event was set. Record flooding occurred along the Tweed River and major flooding along the Richmond River. This was the first flood to breach the Lismore CBD flood levee (completed in March 2005) and the highest flood peak since the record floods of March 1974. A very wet March leading up this event also played a role. 3am 12th June 2017 First peak. 1.15am 14th June 2017 A blocked weather pattern with a large high stalled over southern Australia, coastal troughs and a series of upper level troughs over NSW. This event began as a weak east coast low near Sydney before weakening into a coastal trough which moved to the Far North Coast during Friday 10th. Over a number of days heavy rainfalls occurred but not all in the same areas or continuously. The highest rainfall totals occurred along the coastal fringe with the hinterland receiving less though still substantial accumulations. The transient nature of the falls resulted in only minor flooding in the Wilson/Richmond and Brunswick rivers, but with two peaks. During the evening of the 12th an ECL formed off the SE QLD coast but contracted the heaviest rain away Tuesday morning and weakened. Summary list of major flood heights at the Rowing Club gauge from highest to lowest. The Mother's Day Flood: Lismore was hit with an unprecedented second major flood event in the space of two months. These flood pictures were taken overlooking the Lismore basin then around the central business district. The flood peak had dropped about 20cm by this time. Two floods in one month! After the biggest flood since 1974 hit the region on 2nd April 1989, a second flood for the same calendar month occurred. A few photos were taken near the Lismore rowing club and Browns Creek pump. Major flooding returns to the Lismore region - it had been 12 years since the last major flood to hit Lismore. This CBD inundation proved to be the final straw to get the Lismore flood levee built. The pictures on the 1st were taken near Eltham, and on the 2nd near Eltham and in the Lismore CBD. Major flooding along the Clarence River occurred this time with a smaller event in Lismore. The flood photos are taken of the Wilsons River at Eltham and along the Bangalow Road leading into Lismore. Just three months after the Lismore CBD flood levee was finished, it was given its first test. Major flooding peaked at the low end of the major level. It illustrated how well the levee worked in protecting the CBD from 90 per cent of floods that occur in the region. The flood photographs are taken near Eltham and around Lismore. Moderate flooding along the Wilsons River into Lismore with a major flood in the Brunswick Valley. The pictures are taken around Eltham and Lismore. Moderate flooding and wild seas occurred due to an intense low off the coast. The river peak in Lismore was quite slow to arrive with floodwaters persisting from the 4th to the 6th. The pictures are taken near Eltham and the Tweed Coast. Major flooding occurred along the Richmond River in January 2008 with Kyogle hit hard. Lismore was lucky and only saw moderate flooding. Most low lying areas along the Richmond River were inundated with some record stream rises. [4th Jan 2008 Flood Pictures] taken from McLeans Ridges, Eltham, Boatharbour and Lismore. [5th Jan 2008 Flood Pictures] taken at South Lismore, Fairy Hill, Casino, Leycester, Rock Valley, Kyogle and Lismore. [6th Jan 2008 Flood Pictures] taken McKees Hill to Clovass on the Bruxner Hwy. [7th Jan 2008 Flood Pictures] taken from a NSW State Emergency Service (SES) helicopter between Lismore and Coraki including stranded cattle rescued along the Wilsons River near Coraki. [8th Jan 2008 Flood Pictures] taken between Lismore and Coraki from the SES chopper, and at Coraki. [9th Jan 2008 Flood Pictures] taken around Coraki from the SES helicopter then during two SES flood boat operations. Major flooding occurred along the Wilsons, Richmond and Clarence rivers in May 2009. The Lismore flood levee protected most of the central business district from inundation. [21st May 2009 Flood Pictures] taken from McLeans Ridges, Eltham and Booyong. [22nd May 2009 Flood Pictures] taken at McLeans Ridges, Eltham, Goonellabah, Lismore, South Lismore and North Lismore. Local flooding in the Eltham and Booyong areas following 200mm overnight 3-4 Oct, most of which fell between midnight and 3am. [4th October 2010 Flood Pictures] taken from McLeans Ridges, Eltham and Booyong. Local flooding in the Eltham area following 24 hours of moderate to heavy rain across the Wilsons River valley upstream of Lismore. Local flooding around Eltham and Booyong then major flooding into Kyogle late evening. River and flash flooding around Eltham and Booyong. Local flooding around Booyong and Eltham. Local flooding around Booyong and Eltham and Wollongbar storm damage. Local flooding around Pearces Creek and Eltham and Lismore floods. Major Flooding Lismore and district. Lismore CBD flood levee overtopped for the first time since it was complete in 2005. Local and flash flooding Eltham Valley during 11 and 12 June.